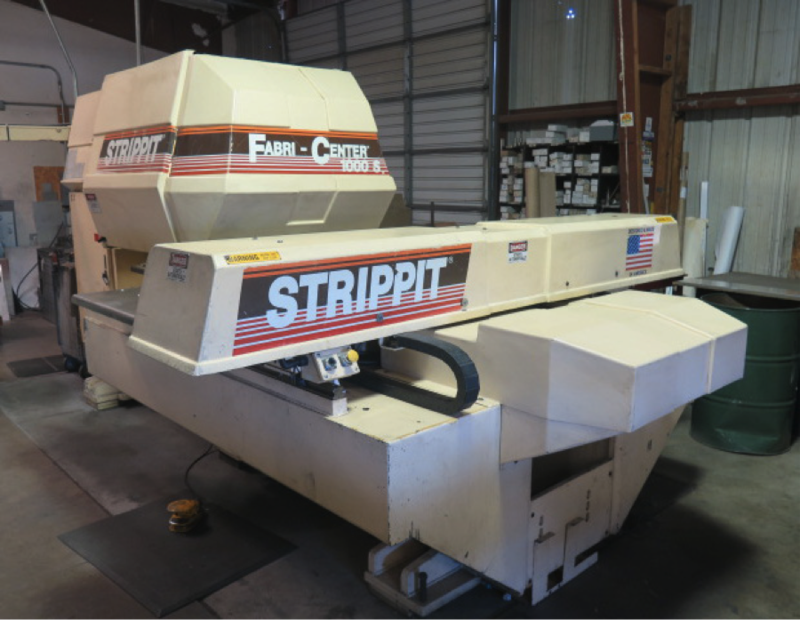 Strippit Fabri-Center 100S 30 Ton Cap x 33-Station CNC Turret Punch Press s/n 1060103192 w/ GE Fanuc Controls, 33-Station Thin Turret, 3-Indexable Tool Stations, Sheet Repositioner, 41” x 91” Ball-Top Table. DiAcro mdl. 14-72 14GA x 6” Hydra Power Press Brake s/n 6600574104 w/ Manual Back Gage, 72” Bed Length, 9” Throat, 61 ¾” Between Uprights. DiAcro mdl. 14-48- 2 14GA x 48” Hydra Power Press Brake s/n 6820679483 w/ Manual Back Gage, 48” Bed Length, 6 ½” Throat, 36” Between Uprights. Crown 8 ¾” x 8 ¾” Power Notcher w/ Fence System. Wysong mdl. 1072 10GA x 6’ Power Shear s/n PA-540 w/ Dial Power Back Gaging, 55” Squaring Arm, 35” Front Supports. AEM mdl. 401-37 36” Belt Grainer s/n MO6357 w/ AEM Controls, 36” Belt Feed, Cyclone Style Dust Collector. PemSerter Series 4 6 Ton x 18” Hardware Insertion Press s/n J4-2764 w/ Tooling. Rotex No. 18 18-Station Turret Punch s/n 471002 w/ Stand. Roper Whitney mdl. 58 Kick Punch s/n 1997-9- 66 w/ 18” Throat, TZ EZ Radius Corner Radius Notching Set. Roper Whitney 4-Ton Hand Punch s/n 2040-2- 80 w/ 12” Throat. Roper Whitney No. 218 Hand Punch s/n 2-89 w/ 12” Throat. Niagara 36” Slip Roll w/ Stand. Milwaukee mdl. FS Die Filer s/n 5617. Strippit FC-1000 CNC Turret Punch Press s/n 0303576 (FOR PARTS). Bridgeport Vertical Mill s/n 143661 w/ Mitutoyo DRO, 1.5Hp Motor, 60-4200 Dial Change RPM, Chrome Ways, Power Feed 9” x 42” Table. Clausing Vertical Mill s/n 010108 w/ 180-3250 RPM, 6-Speeds, 6 ¾” x 26” Table. RMS Ramco mdl. DY-350 14” Vertical Band Saw s/n 685158 w/ Blade Welder, 19 ¾” x 21 ¼” Table. Packard 5-Speed Pedestal Drill Press. Delta 1” Belt / 8” Disc Sander w/ Stand. Craftsman 1” Belt / 6” Disc Sander w/ Stand. Kalamazoo 7” Abrasive Cutoff Saw. Lincoln Square Wave TIG-355 Square Wave AC/DC TIG and Stick Arc Welding Power Source s/n U1950618953. Acme Type 101 10kVA x 18” Spot Welder. 30” x 42” Steel Welding Table. Strippit Thin Turret Punch Tooling. Drills, Taps, Reamers, Endmills and Perishable Tooling. Misc Raw Materials Including Aluminum, Stainless and Cold-Roll Sheet Stock w/Racks. Metron 24” Vernier Height Gage. (2) Fowler 24” Dial Calipers. (6) Mitutoyo, SPI and Import 12” Dial Calipers. (2) Kanon 24” Vernier Calipers. SPI 18” x 24” x 3” Granite Surface Plate.